The engine is ‘George the Fifth’ 4-4-0 No. 1481 Typhon (not Typhoon, as given incorrectly in the list in Baxter, though it is correct in the index) and seems to be unlined and without a coat of arms on the driving splasher. It is standing on the down through line beside the 1867 station at Crewe, under the footbridge which crossed the north ends of all the platforms and gave access at its west end to the North shed. On the back is the stamp: ‘H. J. Patterson Rutherford, “Donegal”, 64 West Cliff Road, Broadstairs, Kent, Eng’. So what are the carriages? And what is the working? Even after blowing up the image as much as possible the rather unusual looking lettering on the coaches cannot be deciphered. The figures leaning out of the coach windows appear to be soldiers and the third vehicle is a cattle truck. This suggests a military special of some kind. The carriages are not LNWR. May well be Great Central (third class) or even Great Eastern. They seem to have some (chalked?) inscriptions which I cannot read. The fact that the engine is unlined suggests wartime. The men looking out of the windows make me think it is probably a troop train (the coaches in the train destroyed at Quintinshill were GCR). H. J. Patterson Rutherford was busy with his camera in the early 1920s although I am not sure of the extent of dates he was active. As might be expected many of his subjects are in the south-east although he certainly travelled quite widely. The stock looks Great Western and by the state of it could perhaps have been borrowed from a miners train. The heads looking out are military and the third vehicle looks like a cattle wagon, often used on military specials to carry horses. I would guess on the way to camp around 1920. Is the engine devoid of markings or just dirty? Can't help you with the carriages, but from the information in the picture it looks to me as though the Typhon is working some sort of military train, possibly a cavalry division as I think I see a horse box (Third Vehicle). Mind you there were a lot of horses used in WWI. There is a lot of possibilities with this one. Sorry I can't be of more help. I don�t think that the six-wheeled coaches are either GWR or Furness. The first is almost certainly Great Central Rly, the second with the large 3 on the doors is, I think, Great Eastern. Being a 5-compartment, 6-w, arc-roofed carriage, it does bear more than a passing resemblance to the Midland D493, all Third.Over 700 built between 1884 & 1895. Although the last is said to have to have survived until the mid-1950's, by the start of WW1 the earliest ones would have been 30 years old - which may account for their scruffy appearance. Notable features are the oil lamps on the roof centreline, the top step on the carriage end, the roof handrail on the LHS of the end, angled axlebox ends. Diagram and photo are on p.107 of Lacy & Dow's 'Midland Railway Carriages', Vol.1. If anyone can offer a similar resemblance to something of GC, GE or other origins I'd be interested to exchange pictures to 'trade' features! A thought about the appearance of the carriage sides � as the train is heading north, the sun is clearly in the west and I would say lowish in the sky as the underframe detail is reasonably clear (not just lost in a big shadow).Note also the shadow across the tender, which I think is from the signal gantry post. So at this height of sun, there would be odd bright spots and reflections. Also What are the two chaps doing on the station roof? Repairs? John Quick of the GCRS, who has done a lot of work on the carriages of MS&LR, GCR, LD&ECR and WM&CQR, is quite sure that neither of the carriages originate with any of those companies. Just to concur with Philip Millard it is more than possible that these coaches are either obsolete Great Central vehicles or similar. 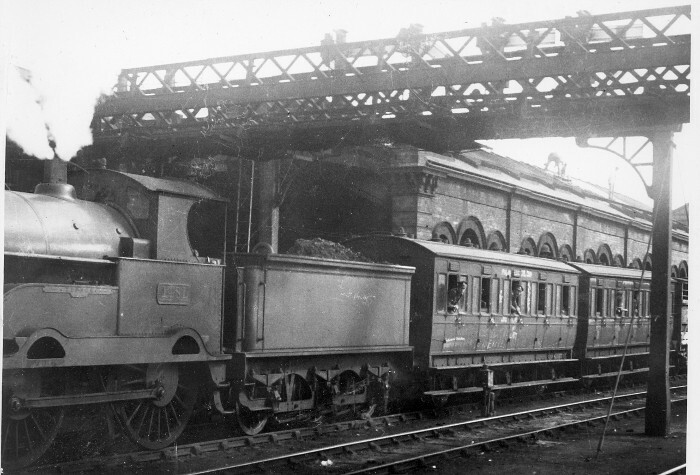 As there appears to be only two 'passenger' carrying vehicles, with a total of eight compartments; say six men to a compartment, making 48 men in total giving 8 gun crews; the 'hint' of a horsebox with probably more behind, and lastly bringing up the rear would be the guns etc on flat cars. The train is standing on the down through line at Crewe. Liverpool was the embarkation point for Gallipoli, which was were the Royal Scots were heading for when they were killed in the Quintinshill crash. I bow to John Quick�s superior knowledge. But privately I am not totally convinced. The coach appears to have the panelling style which I associate with the GCR, or more accurately the MS&LR. The third coach with the large 3 class designations on the doors can only be Great Eastern. The third vehicle is a cattle truck, not a horsebox. I have the idea that cattle trucks were used to convey the horses of the men, officers� horses were entitled to a horsebox. What lines do the signals on the Gantry apply to please. I have studied this picture carefully through a decent magnifying glass and can see no sign of lining on the engine or of the coat of arms which might be expected to be visible below the nameplate. The engine is extremely dirty, so either these details are obscured by dirt or they are simply absent, the engine having been repainted in plain black after September 1914 when Crewe Works paint shop ceased lining out. The �coal� on the tender seems to be little more than a pile of dust and slack. The only word chalked on the carriages that I can read is �EXPRESS� � at the bottom of the panel to the right of the second door on the first coach. What the men are doing on the station roof, I do not know, but they seem to be fitting the dark covering (whatever it is - not solar panels, I think) and working their way towards the road bridge over the station. From the state of the engine and carriages, and the poor coal, my guess was that the picture was taken during the Great War but I suppose it could just as easily date from the early 1920s. The engine kept its LNWR numberplates until June 1928, so the photo could have been taken in LMS days. The two carriages look similar to each other, so both might be from some LMS constituent, one of them having been repainted with the large '3' on the doors. The ventilators above the carriage doors look like those used by the L&YR, but other details suggest that these weren't ex-L&Y carriages. can see that they are fully panelled, and that the first carriage has been graffitied. I can make out the word 'EXPRESS', but nothing else. The door handles and grab handles are definitely Midland style. The MR started using '1' & '3 instead of 'First' and 'Third' in 1906. The livery on the second carriage looks a bit darker than the first, and generally looks less scruffy. So it has possibly had a more recent repaint, and had '3' applied to all 5 compartment doors. The bolthead and strap count along the solebar also tally well with the D493 photo. We can also see the smaller grab rail on the RHS of the vehicle end. I'm fairly sure both carriages are of the same origin, as so many features are identical. Another feature I've just noticed are the 2 small 'blocks', above the 2 adjacent windows of the second and third compartments. Again they are clearly visible on the D493 photo, and are shown on the GA drawing, number 561. I think they could be clips for destination boards. What about the cattle wagon? It is not LNWR with two horizontal rails in the gap above the sides like the Midland (and some other railways too). Maybe the whole train is Midland? It is well white-washed - up the the top of the second board from the floor. This practise ceased around 1926/7, giving a latest possible date for the picture. The external side framing is quite distinctive - there are horizontal members near the top of the sides and also in the centre. There is a diagonal member rising from the bottom corner at the end towards the centre doors. As Mike identified, there are two rails in the opening above the side / below the roof. It is definitely not of Midland origins. I think we can also discount L&Y, and those from the GC, GN or GE that lasted into LNER days. The only match I can find so far with this style of framing is SECR, possibly Diagram 1518. Such a vehicle can be seen in plate 49 of Mike King's "Southern Wagons Pictorial". Possibly Volume 3 of "An Illustrated History of Southern Wagons" by King et al. would provide more information - unfortunately I do not have a copy. The signal on the gantry is off. This seems to apply to the train. Is departure therefore due? What does the ground signal say about the layout? Typhon, as Typhoeus, appears as a monster already in Homer (Iliad 2.782-3). What learned persons (in Crewe or Euston?) chose LNWR names of locomotives? Did they need Directors� approval? George Huxley. What learned persons (in Crewe or Euston?) chose LNWR names of locomotives? Did they need Directors� approval? Well George to find the answer I turned to that font of all historical railway knowledge : W. Mills and his peerless tome: 4' 81/2" and all that. From the book: " Crewe works.............most important place of all - the Engine Naming Studio" Where: "........this shop is entirely staffed by poets......". So now we know. To attempt to answer George Huxley's first two questions, the train is standing on Down Through No.2 and the signals do indeed apply to that line. The line in front of it is Carriage Siding No.2 (a dead end), and then Down Platform no.2 line, with the photographer standing on Platform 2 itself. Behind the screen wall (the limit of the pre-1906 station) is Up & Down Platform 3. The signalling diagram for Crewe North Junction SB was published in "Railway Engineer" vol 28 p43. It was later reproduced in "Hornby Book of Trains" for 1930/31. Referring to this, the four signals on the gantry relate to, from R to L, the routes to Down Chester, Down Fast, Down Slow and Down Manchester. The lever numbers in the miniature frame at Crewe North were 234, 230, 236 and 227 respectively. [at this time the quadruple track extended only as far as Moreton's Crossing, and it was convenient for the Down Fast to be the westernmost line. This was changed when the four tracks were extended to Winsford in 1926]. So the signal (236) is off for this train, from Down Through No.2 to Down Slow. The train has passed the signal, so must be in motion. The ground signal also applies to Down Through No2. There was no direct route from this line into any of the Works Sidings nor to the Long Neck, so the ground signal must have been used for shunting movements to run ahead to clear the points before setting back. The three ground signals controlling the exit from Carriage siding No.2 were out-of-site to the left. I saw a postcard print of this picture today, so a different format, with more of the engine on the left and three cattle wagons on the right. Written on the back was: ‘Dragoon Guards special leaving Crewe’.